Sony Pictures takes another stab at its Spider-Man license with Venom, a movie based on the titular antihero last seen on the big screen in 2007's Spider-Man 3. But with Spider-Man currently being licensed out by the studio to Marvel's own Marvel Studios, it was clear going in that we wouldn't be seeing much of the beloved webslinger in this particular movie. What we have instead is a standalone movie that is expected to lay the groundwork required to jump start a new connected universe. And with a more than capable cast that includes heavy hitters like Tom Hardy, it would look like Sony might be on to something here, right? Well, not quite. 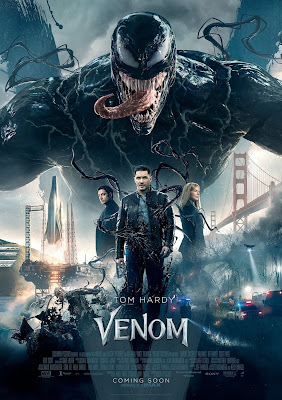 Tom Hardy stars as Eddie Brock, a hotshot reporter who loses everything after he attempts to bring down Carlton Drake (Riz Ahmed), the wealthy CEO of a bioengineering company with some shady practices. At the start of the movie, the company recovers a group of lifeforms called symbiotes from a comet in space, one of which escapes after their space vessel crashes during reentry into the Earth's atmosphere. They eventually begin conducting experiments with one of the remaining symbiotes in their possession, the titular Venom, looking for a perfect host for it in a bid to learn how we might better adapt for survival on other worlds. During a convoluted break-in into the company's research facility, Eddie Brock comes in contact with the symbiote, becoming its ideal host. This imbues him with superhuman abilities as well as an insatiable hunger that is played to great comedic effect throughout the movie. They manage to escape from the facility, but are soon hunted down by a group of mercenaries, leaving Eddie with no choice but to seek help from his ex-girlfriend, Anne (Michelle Williams), and her new boyfriend, Dr. Dan Lewis (Reid Scott), with all this happening as the other escaped symbiote makes its way to the research facility for some sort of ultimate showdown. It's been a while since I've seen a genuinely bad movie, and of the last few I remember, Venom is one of the more entertaining ones. The film felt like a throwback to a time when comic book movies didn't aspire to be anything more than CGI-laden adaptations of their source material, which could've worked on a purely nostalgic level of course, if only the finished product didn't feel slapped together. The movie's tone was all over the place, and it was clear that the director was just as conflicted as the title character, as he never quite seemed to decide if the movie he was making was a horror film, a superhero origin story or a straight-up comedy, ultimately failing on all three fronts. The film's sole saving grace was its cast members, with Tom Hardy in particular giving a surprisingly comedic performance in the duel roles of Eddie Brock and Venom. But even that couldn't save what was essentially a missed opportunity, and its hard to imagine just how viable a connected universe filled with Spider-Man villains is going to be after this. Hopefully he gets a chance to put those acting chops to better use when (if?) we get the eventual crossover with Sony's next iteration of the webslinger and some of Marvel's better known properties.